What could Madison look like 75 years from now? 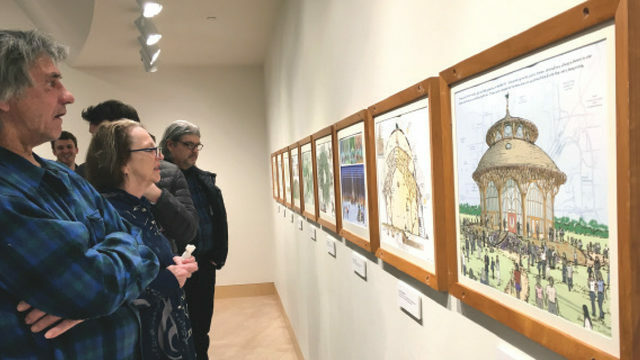 Find out at the James Watrous Gallery in the Overture Center for the Arts, which is exhibiting “Future Possible: Imagining Madison” until April 15. Artists, architects and designers share their big ideas for building projects and energy usage, present provocative artwork and illustrate their idealism as well as their concerns. Architects Lou Host-Jablonski, Ed Linville and Kate Stalker and artists Ashley Robertson, Anders Zanichkowsky [MFA ’19] and Jeremy Wineberg are among those who contributed to “Future Possible,” made possible by a grant from the Madison Community Foundation, now in its 75th year.